There could be more than two offshore wind turbines per mile of UK coastline under plans being set out by ministers. Business Secretary John Hutton says he wants to open up British seas to allow enough new turbines - up to 7,000 - to power all UK homes by the year 2020. He acknowledged "it is going to change our coastline", but said the issue of climate change was "not going away". The thrust of the idea was backed by Tory Alan Duncan: "We're an island nation. There's a lot of wind around." Mr Duncan added, on BBC One's Politics Show: "We should use that offshore capacity for generating electricity that's clean and secure. "So yes, I think it's inevitable and a good thing that there will be more offshore wind." Ministers want 20% of Britain's energy needs to come from renewable energy sources by 2020, and see wind power as a major element of it. Mr Hutton told the Politics Show there would have to be a switch to low carbon energy production to combat the threat of climate change. He also said the UK needed to become more self sufficient in energy terms: "I do not want in 20 years' time to find that whether the lights go on in the morning is down to some foreign government or someone else." The announcement on Monday, giving the "green light" for the next stage of offshore wind energy, was part of a long-running process, he added. Mr Hutton accepted that, as things stood, the amount of energy he hoped to see produced would need 7,000 turbines. But he would not give a specific figure, saying that the next generation of turbines could be bigger and generate more energy. "Offshore wind is a major untapped resource for us," he said. "It is going to change our coastline, yes for sure. There is no way of making that shift to a low carbon technology without there being change and without that change being visible and evident to people. "We've got a choice as a country whether we rise to the challenge... or stick our head in the sand and hope it (climate change) goes away. It is not going to go away." The other choice was, he said, whether it was "easier to have these developments offshore rather than onshore". Asked what would happen if there was no wind for a few days, Mr Hutton said that was why there had to be a mix of energy sources - including nuclear power - to cover for calmer weather periods. Friends of the Earth's renewable energy campaigner, Nick Rau, said the group welcomed the government's announcement. "The potential power that could be generated by this industry is enormous," he said. "Making Britain a world leader in this form of energy will create jobs, boost the economy and help put Britain at the forefront in the battle to combat climate change." 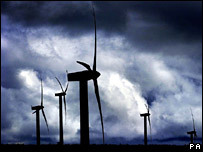 Wind turbines have proved to be controversial onshore and offshore. There have been concerns about their visual impact, the impact on wildlife such as birds and the offshore ones' impact on shipping and fishing.